Designed for 1970-91 304-401 engines, the RPM Air-Gap incorporates the same race-winning technology that's used on the Victor Series competition intakes. The Air-Gap design features an open air space that separates the runners from the hot engine oil resulting in a cooler, denser air charge for more power. 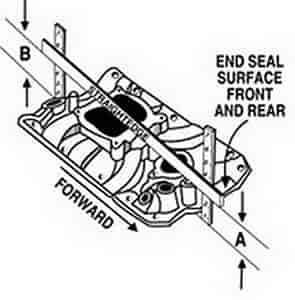 Includes standard oil fill and PCV provisions as well as early air conditioning support bracket accessory bosses. For square-bore carbs only. No provision for exhaust-heated chokes and no exhaust crossover.